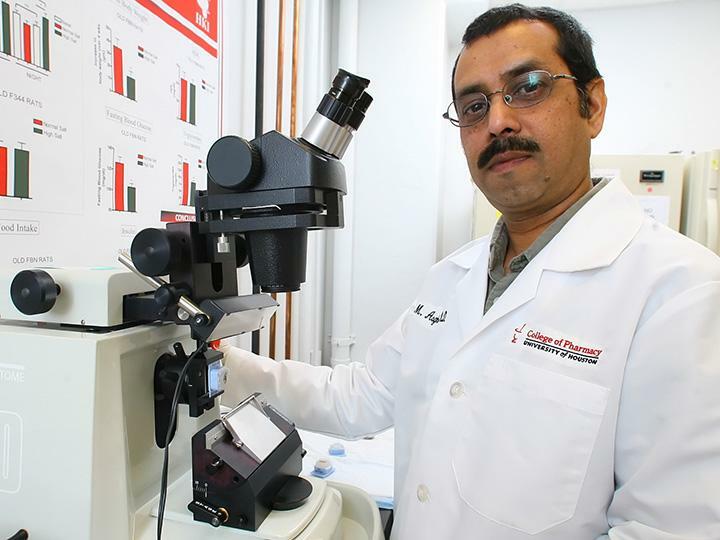 Mohammad Asghar, associate professor of pharmacology at the University of Houston, has been awarded $459,000 from the National Institutes of Health/National Institute on Aging to improve kidney function in people 65 and older, a population at higher risk for developing impaired kidney function. "Unfortunately, kidney function reduces with age and that contributes to cardiovascular disorders such as heart failure and myocardial infarction during aging," said Asghar, whose work could lead to a better understanding of the problem, as well as identifying targets for drug interventions. Kidneys continuously filter the body's blood, sifting out around 51 ounces of urine-containing waste daily to allow the rest of the body to work normally. "If kidney function is reduced, the blood and fluid levels in the body increase. If they increase, they will impact the heart, causing the heart to work too hard, increasing blood pressure," said Asghar. Blood pressure increases in an attempt to normalize body fluid levels. Despite extensive research in this area, the mechanisms that cause reduced kidney function as people age remain largely unknown, but Asghar has some ideas. His preliminary studies demonstrate that reduced kidney function in older subjects is associated with reduced mitochondrial respiration, suggesting a key link between them. Mitochondrion are found in large numbers in most cells where the process of respiration and energy production occurs. That raises the possibility that mitochondrial respiration plays a critical role in the maintenance of normal kidney function. Asghar is examining the interactions between the proteins Nrf2 and Sp1 and mitochondrial ATP-synthase enzyme, a combination that was shown to be decreased in older subjects. "The interactions of the proteins affect kidney function as people get older," said Asghar. He will now set about determining the role of Nrf2 in mitochondrial respiration and kidney function in examining the underlying mechanism of age-related kidney function impairment and identifying relevant targets for drugs that could restore function. "The expectation is that in future these molecules can be targeted therapeutically to restore kidney function and reduce associated cardiovascular events in aging," said Asghar. "It has been said before, but it is true: Protect your kidneys, save your heart," he said.